Oh, Andy Cohen, what have you wrought? 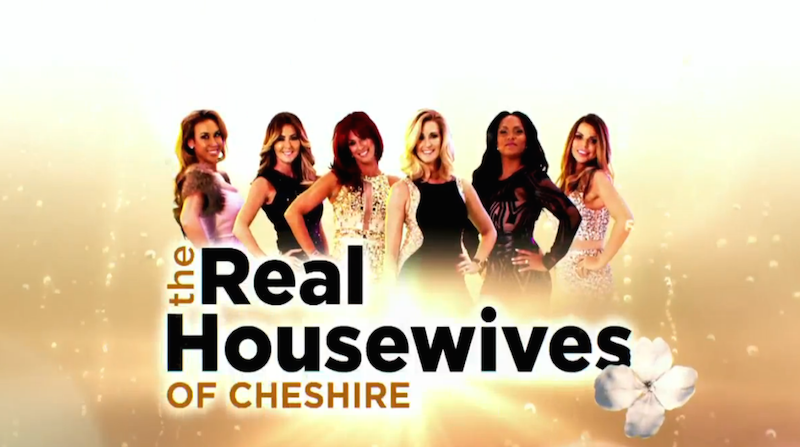 The press release I received told me to say “Cheerio,” so let’s just be that clichéd and say exactly that to Bravo’s newest series: The Real Housewives of Cheshire. In the trailer we learn that, “In Cheshire, there are only two ways to move: up or out.” That’s amazing, even though it sounds super inconvenient for foot and automobile travel. Much like the Real Housewives of Melbourne, Bravo’s second overseas installment of the Real Housewives franchise will air for ten episodes at an inconvenient time (12 pm on Saturdays) and there will be lots of age-inappropriate, sequined cocktail dresses. The apparent nickname for Cheshire is the “Golden Triangle” and if that isn’t enough, all of the housewives have the longest taglines in the history of the franchise. I’d like to draw your attention to the fact that four of the six women are married to professional soccer players. This looks like the Real Housewives crossed with WAGS aka a less high-class version of Ladies of London, and I truly don’t know what we did to deserve such beautiful lunacy. Former model and current life coach, Tanya Bardsley, is a self-proclaimed party girl, shopping enthusiast and plastic surgery lover. Tanya loves watching her soccer player husband, Phil Bardsley, score goals on the Stoke City soccer grounds. The two were married at the prestigious Peckforton Castle in Cheshire and traveled to Las Vegas for their honeymoon with friend of 10 years and fellow housewife, Leanne Brown and her husband. Leanne Brown is a happy housewife who loves shopping, a good party and frequent trips to the salon. She and husband Wes Brown, a defensive soccer player for Sunderland, met at a nightclub and together have three daughters: Hallie, Lilia and Lola. Leanne is currently in the process of launching a children’s fashion line inspired by her own kids. Originally from The Hague in Holland, bubbly and fiery Magali Gorré believes everything in life is about respect, not just money and riches. She and her husband of 21 years, ex-professional soccer player Dean Gorré, are the parents to three soccer-playing boys: Kenji, Quinten and Aidan. Magali is currently writing her third book and has written soccer columns for several media outlets including Esquire, Grazia andThe Telegraph. Savvy businesswoman and recent divorcee, Ampika Pickston, loves to be wined and dined from her many potential suitors. She runs her own lavishly-decorated beauty salon and spa, Opium, catering to the rich and famous of Cheshire. Ampika has one son, Jake, and a puppy named Bella whom she rescued from the animal shelter where she volunteers. Born and bred in Cheshire, Lauren Simon is a stay-at-home mother and self-proclaimed “domestic goddess” who loves coffee, chocolate and men – but all have to be rich. It’s a good thing her husband of 10 years, successful businessman Paul Simon, can afford to pay for her expensive hobbies including diamond shopping and party planning. Before transitioning into her role as a full-time housewife, Lauren worked in public relations and marketing for VIP events and nightclubs. Dawn Ward, a well-respected interior designer whose high-profile clients include British television presenters and models, has been married to Manchester City soccer player and businessman Ashley Ward for 19 years. With her impeccable eye for design, Dawn lives with her husband in a grand family home on multiple acres, which houses their four daughters, private horse stables, and a personal beauty salon. Dawn’s annual charity ball, Crème de la Crème, has some of the most sought-after tickets in all of Cheshire.